The political future of the Progress Party’s Fisheries Minister Per Sandberg was in grave doubt heading into the weekend, as the list of his recent offenses continued to grow. Prime Minister Erna Solberg was also under enormous pressure from Parliament to replace him. Sandberg survived replacement at Friday’s weekly Council of State, the formal meeting between the government and King Harald V at the Royal Palace. That’s when most top-level personnel changes are made that formally require royal approval. His future now is said to hinge on how he answers all the questions he’s been sent by Members of Parliament, and whether that will lead to a hearing before the Parliament’s disciplinary committee or a lack of confidence vote before a hearing is even held. Solberg is under pressure to avoid either, since it would weaken or even topple her government, and there surely is intense discussion going on regarding Sandberg’s fate. Solberg leads Norway’s conservative government coalition along with Finance Minister Siv Jensen, who in turn leads the Progress Party together with Sandberg as her deputy. Jensen has mostly remained unusually quiet as the drama around Sandberg has played out over the past two weeks and now reached crescendo pitch. 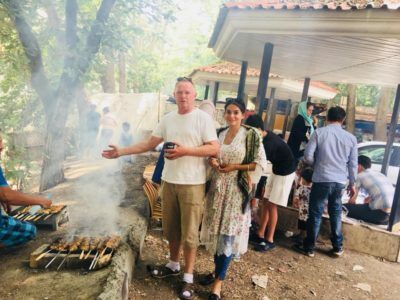 Sandberg is already guilty of making a highly controversial summer holiday trip to Iran without registering his plans for the trip beforehand as required under government regulations. He has also admitted taking along the mobile phone he used in his daily work, thus violating the practice recommended by security experts at Norway’s intelligence agencies. He was ordered to surrender his phone upon his return, with intelligence agencies then facing the difficult task of determining whether it had been hacked, which could have exposed Sandberg’s passwords and sensitive government information. Sandberg, age 58, also traveled to Iran with a 28-year-old woman who came to Norway as a refugee from Iran itself. Sandberg has since confirmed the two have a romantic relationship, putting him in another situation that would have risked his security clearance if he’d been employed by either the foreign or defense ministries. It also has emerged that when Sandberg attended a celebration of Iranian independence at the Iranian Embassy in Oslo earlier this year, he did so not in an informal role of accompanying his new partner, Bahareh Letnes, but in his capacity as a government minister. That’s controversial because it could be viewed as official Norwegian government support for the Iranian regime, when if fact Norway is highly critical of the human rights situation in Iran and especially its frequent use of capital punishment. 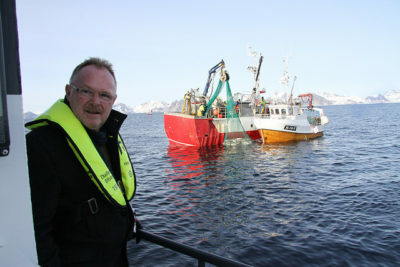 Questions have also arisen over a company Letnes founded earlier this year with the purposed of boosting Norwegian seafood exports to Iran. It also emerge that she had applied to work as Sandberg’s assistant in 2016, before they became romantically involved. Sandberg has said he wasn’t aware of her job application and denies any conflicts of interest between his postion as fisheries minster and her budding seafood export business. All the opposition parties in Parliament, plus the centrist Christian Democrats who hold a critical swing vote, were blasting Sandberg on Friday as more recent offenses emerged. He now faces even more questions, also from Solberg herself, after he admitted to reporters on Thursday that he consciously chose to ignore government rules requiring all top-level officials to report their travel beforehand and that they should not take their government-issued mobile phones or other data equipment with them. Sandberg did, both to Iran and to China last spring. Solberg’s initial comment that “it’s allowed to make a mistake” had already drawn harsh criticism and allegations whe was not taking Sandberg’s offenses seriously enough. Labour Party leader Jonas Gahr Støre went further on Friday morning, saying on state broadcaster NRK’s popular morning debate program Politisk kvarter that “no, not everyone can make mistakes like that, because it’s dangerous.” He also lashed out against Sandberg’s attendance at the Iranian embassy celebration, suggesting that the Iranians must have felt “they’d hooked a very big fish” when a government minister attended their party. Sandberg’s failure to inform Solberg’s office or his own ministry about his plans to travel on summer holiday to Iran, and his decision to take his work phone with him, continue to be viewed as his most serious offenses, since both constituted a breach of security regulations. They even elicited more stinging and highly unusual criticism this week from a former head of Norway’s military intelligence Kjell Grandhagen, who told newspaper Aftenposten on Thursday that Sandberg “should evaluate his position” and probably resign. Grandhagen, who first criticized Sandberg last week, confirmed this week that Norway’s foreign ministry, defense ministry, intelligence agencies and authorities charged with national security would view such offenses as “extremely serious” and cause for revocation of security clearance. He also noted that Sandberg initially didn’t seem to take his own actions seriously himself, downplaying them and even threatening at least one journalist who questioned him. “In total, this shows behaviour that, in my estimation, would have had serious consequences” for most other government servants, Grandhagen told Aftenposten, adding that “this is where politics collides with leadership.” He thinks Solberg faced a choice of either supporting her government minister or following the course that would have been taken otherwise in management of the public trust. She has initially opted for the former, at least so far. Svein Harberg, a Member of Parliament for Solberg’s Conservative Party who also serves as deputy leader of the Parliament’s disciplinary committee, insisted on NRK Friday morning that Solberg was taking the Sandberg case seriously and “following up” on all the allegations against him. “The most important thing is that he (Per Sandberg) has broken the rules,” Harberg acknowledged on national radio. “He must be held accountable for that and we need more answers.” He noted that Solberg also has “had a long conversation with Per Sandberg” and already publicly rebuked him by confirming in an initial written response to Parliament last week that “Per Sandberg has not followed the security advice and routines for use of mobile telephones and informing about trips.” As of Wednesday, though, she said she still had confidence in him. Sandberg’s response to all the questions formally filed by MPs and by Solberg was due by Monday. In a brief meeting with reporters during an official appearance in Mandal on Thursday, Sandberg wasn’t willing to answer many questions and said it must be “up to others to decide whether I have damaged Norwegian interests.” He claimed that he “regretted” and has apologized for traveling to Iran without informing the government before departure. “And I have apologized for taking my phone with me,” he said, adding that he didn’t want to reveal “what evaluations I made because I chose not to register (his trip beforehand) and to take my phone with me.” That set off a stream of other questions that weren’t answered when his ministry’s staff quickly hustled him away from the media, according to video from the chaotic session and reports in both Aftenposten and on NRK. Sandberg also defended his decision to attend Iran’s national celebration at the embassy in Oslo. “As a minister, or if you sit in Parliament, you get invitations from nearly all the embassies, and I have participated in several other embassies’ national celebrations,” he told reporters. He showed no signs of resigning his ministerial post voluntarily, even though some high-profile members of his own Progress Party have been nearly as critical as opposition politicians. Prime Minister Solberg must also respond to Parliament’s questions by Monday.